*Page Yield Footnote – Tested in HP Deskjet Ink Advantage 2515 All-in-One. Approximate average based on ISO/IEC 24711 or HP testing methodology and continuous printing. Actual yield varies considerably based on content of printed pages and other factors. For details see http://www.hp.com/go/learnaboutsupplies. 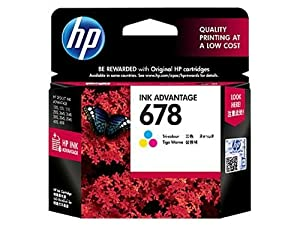 This Cartridge is Compatible with HP Deskjet Ink Advantage Printers of the Following Models – 1015, 4645 All-in-One, 3545 e All-in-One, 3548 e All-in-One, 4515 e All-in-One, 4518 e All-in-One, 1515 All-in-One , 1518 All-in-One, 2645 All-in-One, 2648 All-in-One,2515 All-in-One , 2545 All In One and 3515 e All-in-One.